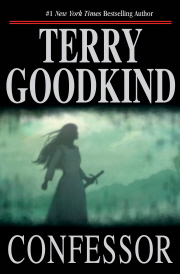 Terry Goodkind's Confessor debuts at number 2. For more info about this title: Canada, USA, Europe. Laurell K. Hamilton's A Lick of Frost is down two positions, ending its fourth week on the charts at number 17. For more info about this title: Canada, USA, Europe. Clive Barker's Mister B. Gone is up two spots, finishing its third week on the NYT list at number 22. For more info about this title: Canada, USA, Europe. R. A. Salvatore's The Orc King is up one position, ending its eighth week on the bestseller list at number 24. For more info about this title: Canada, USA, Europe. Cormac McCarthy's The Road maintains its position at number 8. This marks the book's 33rd week on the prestigious bestseller list. For more info about this title: Canada, USA, Europe. Karen Traviss' Star Wars: Republic Commando: True Colors is down five spots, finishing its second week on the charts at number 28. For more info about this title: Canada, USA, Europe. I've been fascinated with the Knights Templar and their demise ever since watching a documentary on their order during my early teenage years. There is something about the Knights Templar that really captures one's imagination. As a matter of course, I read Holy Blood, Holy Grail, which then led me to order various related works such as The New Knighthood and The Trial of the Templars. Hence, long before The Da Vinci Code introduced them to mainstream readers, I was already intrigued by the mystery and mysticism shrouding the Order of the Temple. It was thus with great eagerness that I read Jack Whyte's first Templar novel. Knights of the Black and White recounts the beginnings of the order. It's a tale about those nine penniless men who dug for years into the bowels of the Holy City of Jerusalem, and unearthed a treasure which allowed them to become the most influential force in Christendom for more than two centuries. I really enjoyed how Whyte sets the stage at the start of the novel. Sir Hugh de Payens, a member of a secret society, learns the grave truth about the Order before being sent to fight in what history will remember as the First Crusade. But he emerges from the harrowing slaughter of Jerusalem as a broken man who has lost faith in his fellow knights. Knights of the Black and White is an interesting blend of historical data and good storytelling. Anyone who has ever shown any interest in the Knights Templar should be pleased with the tale. Others might not find this book as appealing, however. . .
Whyte's narrative sets the mood, and his prose is evocative in a manner that creates the perfect imagery. There are a few info dumps along the way, most of them a necessary evil in a work such as this. What I found the most distracting was the author's tendency to switch from one POV character to the next in the same sequence, without even a break in the scene to signal a POV change. The characterization is an aspect that leaves a little to be desired in some instances, and that was disappointing. Some characters are well-done; Hugh de Payens and Hassan the Shi'a come to mind. Yet others are clichéd and two-dimensional, characters such as Princess Alice, Brother Stephen St. Clair, and Bishop Odo. Still, the storylines weave a satisfying tale, even though this first volume covers only the order's humble beginnings. It will be interesting to see where Jack Whyte takes his story in the sequel, Standard of Honor. Hopefully weak characterization will not put a damper on one's reading experience in the subsequent volumes. 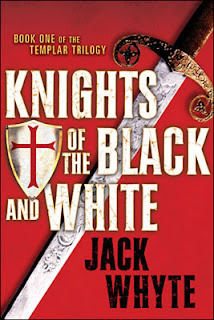 As the opening chapter of a saga chronicling the birth and future destruction of an organization whose secrets echo down the centuries to tantalize us even today, Knights of the Black and White remains an entertaining read. With Daniel dropping by and leaving comments on a number of posts, I realized that I completely forgot to link his latest report of that symposium of his. Another interesting article which you can read here. I'm aware that there was a lot of interest for this Q&A. Many thanks to the folks at Tor Books and Julie for helping me to put this interview together. - Your newest title is one of the most eagerly awaited fantasy book of 2007. 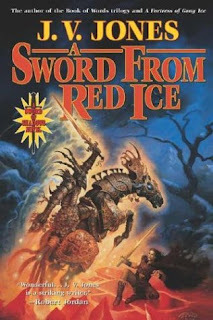 What is it about A Sword from Red Ice that made the novel more arduous to write than your previous books? At one point A Sword From Red Ice became too big for me. I had ten point-of-view characters to write for, and while I was swapping between them I had a sense that I was losing focus. Raif, his brother, sister and clan, and Ash are the main subjects of the series, and I had to stop and refocus upon them. That meant cutting out characters who I was genuinely interested in and delaying their appearances until later in the series. Then I went back and restructured the book. This took time. However, the main reason why the book took so long is that I was developing as a writer. By the time I reached the final scene, the prologue and early parts of the book no longer reflected my experience as a writer. My work has, I hope, become leaner and more truthful. I’m glad I took the time to rewrite and revise: I think Sword is a better book because of it. Readers should expect to learn more about the characters; what they are capable of under pressure and what has the power to break them. I love my characters, but it’s not a blind love. They have faults, terrible faults, and the rest of the series will reveal and highlight them. Subsequent books will offer chances for greatness, goodness, and redemption. At this point even I don’t know who will succeed and who will fail. As I writer I’m interested in the conflicts we carry in our hearts. We’re afraid, yet we act in face of that fear. We love passionately, yet we’re rarely selfless. Books IV and V will show Raif coming to terms with hard realities. How do you live a life when you’re cut off from your family, home and community? What is your responsibility when you can kill an enemy so effortlessly, from a distance, that you don’t have to look him in the eye? - What are the main challenges that you will face as an author in order to finish the series the way you have always envisioned it? The primary challenge for me is tell the truth. I’m writing Epic Fantasy and it’s a genre with strong traditions, and my focus is to keep the story pertinent. I don’t want the world and the characters to be archaic constructions that have no relation to how we live our lives today. I want readers to think,“Yes, I recognize this. I’ve felt like that. I’ve been in a situation where I had to make that choice.” The series is written on a large scale--countries, clans, continents, races--and my main challenge is to hold that scale in tension while telling the personal stories within it. - What's the progress report on the fourth volume the Sword of Shadows saga? Any tentative title and release date yet? I’m writing Book IV right now. If you attended World Fantasy in Saratoga you got a sneak preview of the Prologue, which I used for a reading. The book will be finished next year and I expect it to be published in 2009. - What was the spark that generated the idea which drove you to write the Sword of Shadows in the first place? I’ve always been fascinated with cold climates: arctic tundra, glaciers, sea ice, pine forests blanketed in snow. For me, cold and remote places are filled with wonder and possibility. I have a sense that mysteries lie beneath the ice, that if one were to fall through a fissure in a glacier one might find oneself in another world. The Sword of Shadows series started, quite simply, because I wanted to set a story in a bleak and windswept land. The characters who are the most insecure are the least predictable. Ash, who is deeply insecure, is capable of great shifts in behavior. She’s missing the firm foundation of a family who loved her, and that makes her vulnerable. Oddly enough, the Dog Lord, Vaylo Bludd, never had a family who loved him either, but he has a strong sense of who he is. Ash is a lot younger and hasn’t developed that yet. Plus, she literally doesn’t know where she came from. The Dog Lord always knew he was an unwanted, illegitimate son. That sense of self, when present in a character, makes behavior more predictable. When it’s missing anything can happen. I had a plot when I began, but I didn’t follow it. The characters shanghaied the story and I like it that way. I’m constantly surprised and entertained by the writing process as I’m never quite sure what will happen in a scene. The joy of writing for me is creating that scene, that chance for characters to interact and then allowing them to be themselves. The Dog Lord is a character who wasn’t planned. One day I fancied a break from Blackhail’s storyline and brought him in. The same with Bram Cormac. Now I care about both of them very much. Other characters were already present in the story, such as Marafice Eye and Effie Sevrance, and after a while I chose to write for them, rather than about them. It’s all a bit spare-of-the-moment. As a writer, I want to challenge myself. Writing from different POVs is one of the ways I do that. I hope it’s my characters. I have a strong sense of them and never have to wonder what they’re likely to do in any given situation. They just go right ahead and do it. - The fact that there are a website dedicated to your work is an indication that interaction with your readers is important to you as an author. How special is it to have the chance to interact directly with your fans? http://www.jvj.com/ is one of the longest running writer websites on the internet. We’ve been going since 1994, a year before The Baker’s Boy was published. Back then, we didn’t have our own domain, just a very long URL and handful of bright blue hyperlinks. My brother Paul and I have run it, hands on, from the beginning. And from the very beginning readers have been able to contact me via email. This is important to me. Writing is a solitary profession. When things are going well you spend the entire day on your own. Contact is a lifeline. It reminds me why I write: I want to tell a good story and hopefully entertain someone for a while. For the first four weeks after SWORD came out I regularly did searches for reviews, but apart from that I leave well alone. One can’t control what’s being written about oneself or one’s work so it’s best not to worry too much about it. For SF news I check locusmag.com and for book reviews I read publishersweekly.com and nytimes.com. - Honestly, do you believe that the speculative fiction genre will ever come to be recognized as veritable literature? Truth be told, in my opinion there has never been this many good books/series as we have right now, and yet there is still very little respect (not to say none)associated with the genre. Cormac McCarthy won the Pulitzer prize this year for The Road, which is SF. Right now the entire country is reading the magic realism of Gabriel Garcia Marquez’ Love in the Time of Cholera, as Oprah picked it this month for her book club. Speculative fiction is alive, well and much-honored. What’s not much honored is epic fantasy written in the tradition of Tolkien. 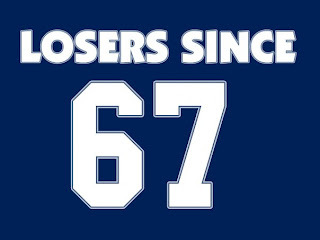 I don’t see this changing any time soon. Just the word “fantasy” alone is enough to send the critics running. Why this is, I’m not sure. To a certain extent all “genres”--romance, westerns, epic fantasy, who dunits--are unfairly dismissed by the critics. - It's said that there's a certain lack of respect from writers (non-speculative fiction) towards authors of genre fiction, especially female writers. Have you had to deal with any such problems and what are your thoughts on the subject? I’ve been told many times that while women buy books by both male and female writers, men prefer to buy books by male writers. I’m not sure if this is true. I believe a book finds its audience through word-of-mouth, and a good book appeals equally to both men and women. I write the story I want to read. That’s my guiding principle as a writer. From an early age I was drawn to epic fantasy. The scale appeals to me, the idea that everything we hold precious depends upon the decisions of a handful of people. As a writer I’m playing with the highest possible stakes--if all goes well, life as we know it continues. If one key thing goes wrong it all ends. That’s exciting to me. It gives me chills and I hope to pass along those chills to my readers. 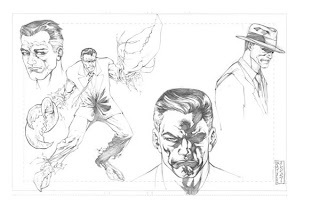 I've been approached by the cool folks at Dabel Brothers Publishing (http://www.dabelbrothers.com/) to help them get the fans involved in two projects they have on the way. As you know, they are the ones that will bring you The Malazan Book of the Fallen and the Wild Cards graphic adaptations. Above you can see a sketch of Whiskeyjack, one of the heroes from Steven Erikson's opus, as well as one of Croyd, a Wild Cards character. They would like to know what sort of promotional material you guys would be interested in. They have been thinking about officially licensed prints of characters or scenes, shirts, or similar products. But they would like to know what the people who'll be purchasing the graphic adaptations would like to get their hands on. 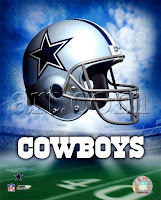 But since the Cowboys have a history of screwing up late in the season, victory is not assured just yet. 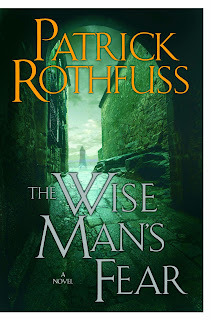 . .
We all knew that Patrick Rothfuss's sequel to his popular debut, The Name of the Wind, has been postponed. But no one knew just how delayed The Wise Man's Fear was going to be. Pat will not be delivering the complete first draft until March, and I've only read a few tantalizing sections. We're hoping to publish in April '09. We're planning at least two rewrites. I'm aware that most of you were hoping for a late 2008 release, but it appears that it's not to be. . . Having said that, I'm glad to see that Daw Books will not rush this one. They obviously want the sequel to live up to the expectations generated by its predecessor, and they will not be publishing a book which is anything less than Rothfuss' best effort. Laurell K. Hamilton's A Lick of Frost is down six positions, ending its third week on the charts at number 16. For more info about this title: Canada, USA, Europe. Clive Barker's Mister B. Gone is down four spots, finishing its second week on the NYT list at number 24. For more info about this title: Canada, USA, Europe. 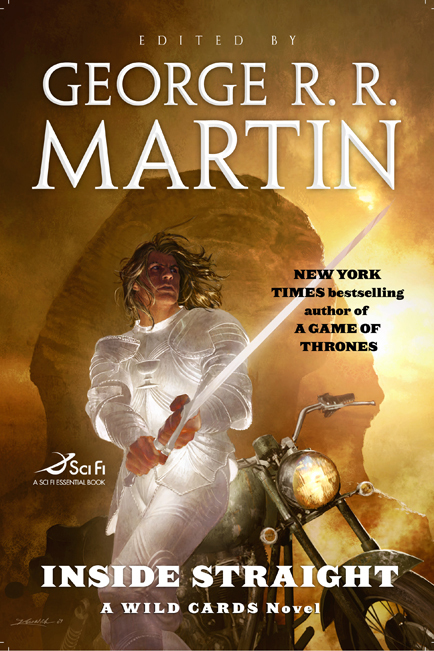 R. A. Salvatore's The Orc King is down two positions, ending its seventh week on the bestseller list at number 25. For more info about this title: Canada, USA, Europe. Kristen Britain's The High King's Tomb debuts at number 29. For more info about this title: Canada, USA, Europe. Cormac McCarthy's The Road is up two spots, finishing its 32nd week on the prestigious list at number 8. For more info about this title: Canada, USA, Europe. Karen Traviss' Star Wars: Republic Commando: True Colors debuts at number 23. For more info about this title: Canada, USA, Europe.